Words can be like blueberries. We need to wait for just the right time to share them, whether through spoken word, written word, or song. If we pick them too early, they will be bitter and will leave a bad taste in the mouth. If we ignore them and leave them on the bush, they’ll simply wither up or fall to the ground without ever getting the chance to share their sweetness. This is also good for the one who wants to share words. I believe that God has perfect timing, and He will order our steps and direct us on when to share words for His purpose. This weekend, I’m going to a songwriting conference led by a hero of mine, Gloria Gaither. Talk about a wordsmith! Gloria, along with another writing mentor of mine, Reba McGuire, sure knows when the perfect words are ripe for the picking. I think in my excitement and anticipation of this weekend’s events, I am remembering a story I wrote last year at Reba’s Writing Room. I’ve wanted to share it for awhile, but the words just weren’t ready yet. Now, with time, with cultivation, and with summer just waiting to breath upon us, the story is ready to share! Happy writing, happy summer, and happy blueberry picking! The bright yellow summer sun shone down on her shoulders as she meandered through the field of knee-high grass. The gentle breeze tapped her on the shoulder and beckoned her to come and play. Wouldn’t it be fun to make flower bracelets and necklaces? Wouldn’t a ride on the swing in the cool shade be the perfect way to spend this hot afternoon? Wouldn’t a splash in the icy creek feel good on her sun-warmed skin? But no, not today. Today she had a job to do. It was blueberry picking time. Granny said to bring back a full pail if she wanted to help make the jam, and she’d never been entrusted with the pail alone before. Getting to make jam with Granny would be better than making a hundred flower bracelets and necklaces. It’d be more fun than swinging as high as that old wooden swing could fly. Granny’s “good job” would feel better than the coolest of waters over her skin. So she continued her trek, past the weathered red barn with the new litter of barn kittens, the old tree that kept her childish secrets, past the garden that baked in the afternoon heat. The trip was so much longer when she was alone. But she kept on. She had a job to do. It was blueberry picking time. Finally, she spotted the cluster of fat blueberry bushes at the edge of the fence. 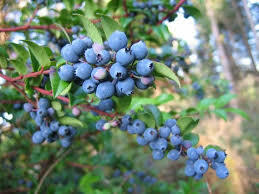 Their limbs were sagging with heavy loads of berries. Ping. Ping. Ping. She sighed. The bucket was so much bigger when she was alone. Filling it would take a long time and a lot of picking. But Granny had said to bring back a full pail if she wanted to make jam. The pings gradually turned to thuds as the pail lost its emptiness. Her fingers and lips stained blue, she hefted up her prize and began the journey back to Granny’s. Past the garden that was just now receiving a gift of shade, past the old tree that kept her childish secrets, past the weathered red barn that seemed to wink at her proudly for a job well done. This entry was posted in Devotionals, Music and Songwriting and tagged blueberries, Gloria Gaither, Reba Rambo McGuire, songwriting, summer, waiting, words, writing. Bookmark the permalink. Great story! And how AWESOME to be going to a conference with Gloria Gaither! WOW! Love the Gaither’s! Mine was picking blackberries with my Gran and Papa – for cobbler! Love the application – something I pray about a lot and have trouble applying. Have an awesome trip, learn a lot, bring us back more stories and songs! Nice piece about blueberries and words. And good story.